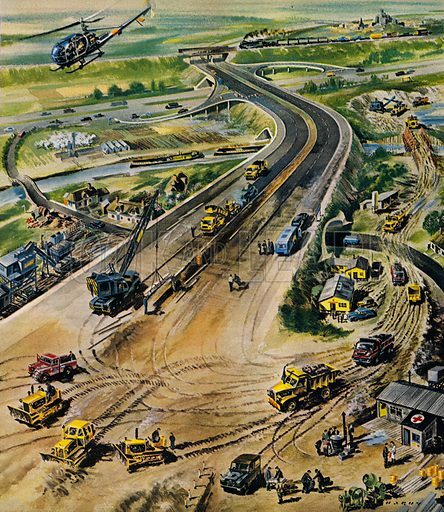 Here is a superb panoramic picture of one of the great infrastructure projects of the 1960s, namely the building of motorways. These astonishing feats of civil engineering can be appreciated when viewed from above as in this image, which reveals the vast scale of the earth works along with the vehicles and many workers involved. The helicopter completes a picture of modernisation and progress, as does the already completed section cutting through the beautiful English countryside. Many more pictures of Britain in the 1960s can be found at the Look and Learn picture library. This is a marvellous and thoroughly realistic bird’s-eye view of a railway station in the London suburbs. 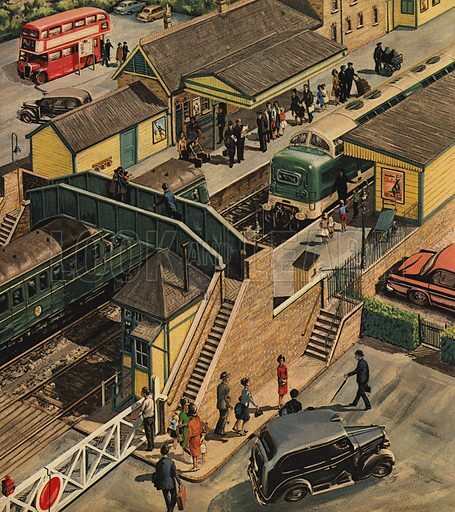 The black taxi picks up a traveller, the red bus brings others to the station, and meanwhile all the architectural detailing of footbridge and station building, along with the level-crossing gate, give one an unavoidable impression of looking down on a child’s model railway layout. The early diesel train is a cleverly modern touch. Many more pictures of railways can be found at the Look and Learn picture library. The Christmas tree in London’s Trafalgar Square is a gift from the people of Oslo and has been given to the capital every year since 1947. 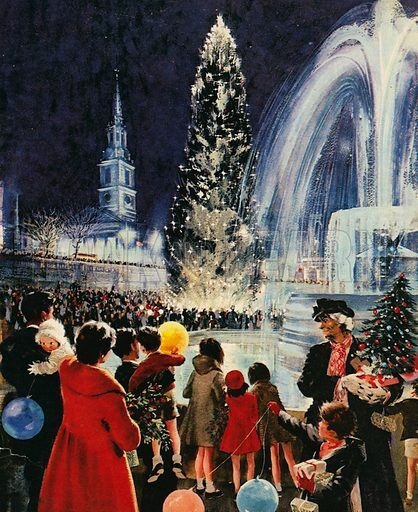 Our festive picture shows a view from the south-west corner of the square; looking past the iconic fountains towards the steeple of St Martin in the Fields, the artist places the famous tree in the centre of his beautiful composition. Many more pictures of Christmas can be found at the Look and Learn picture library. 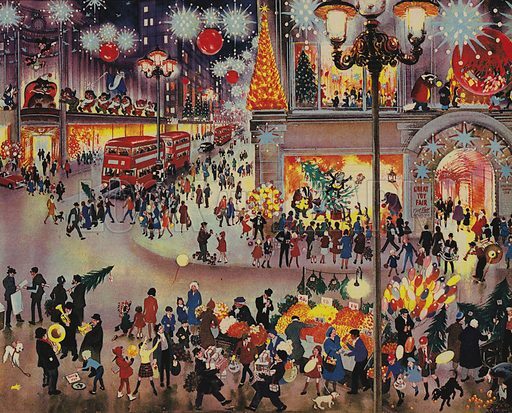 This is a dazzling and painstakingly detailed picture of London at Christmas in the 1960s. The festive lights and decorations on the street are matched by those on the great department stores, and the fruit stall is an especially well-observed feature of London’s streets. The classic red London buses complete an impression of a self-confident joyful capital city filled with families doing their Christmas shopping. This is a brilliantly detailed and realistic picture of a typical Greengrocers in pre-decimalisation Britain. The old £.s.d. 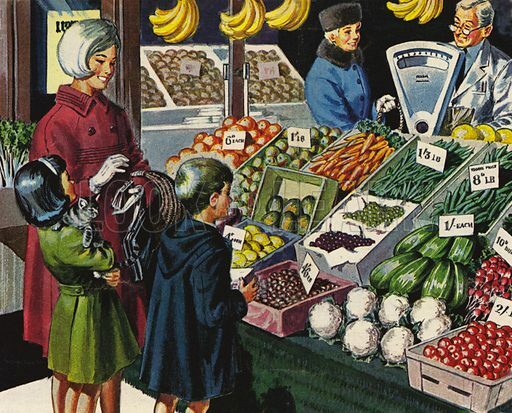 currency is apparent in the price signs, and the weighing scales are particularly evocative of the era, but so is the surprising lack of variety in the shop, which only stocks the relatively few fruit and vegetables eaten in Britain at that time. 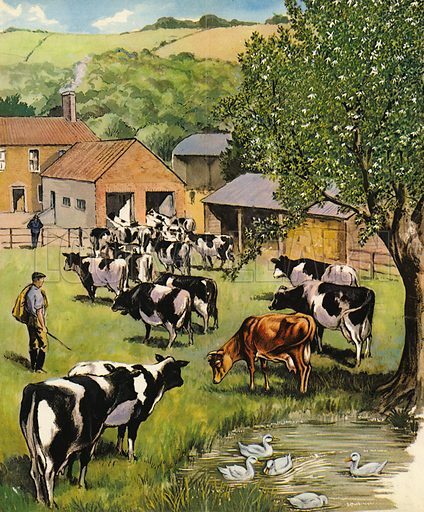 This attractive and typically optimistic picture of an English Dairy Farm in the 1960s is filled with archetypal imagery associated with a pastoral vision of rural England, especially the notable absence of any technological eyesores and fecund herd of those familiar Holstein Friesian dairy cows. Many more pictures of agriculture can be found at the Look and Learn picture library. 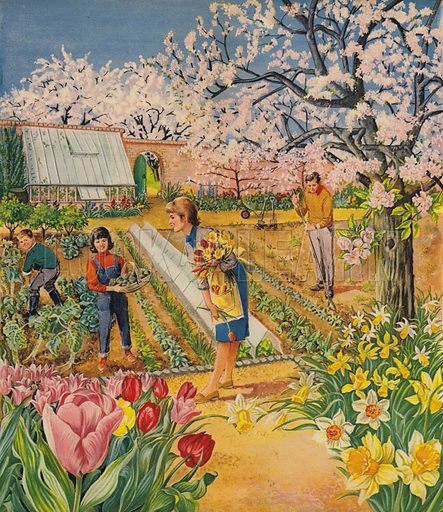 This colourful and very surreal picture of a walled garden is a dazzling composition in which various elements challenge credibility, not least the astonishingly healthy crop of vegetables alongside well-timed perfect tulips and daffodils, and all in very late spring when the cherry trees are in blossom. But somehow these idealised elements coalesce in a garden of nostalgia tended by a 1960s family who look impossibly happy. Many more pictures of gardens can be found at the Look and Learn picture library. This edited article about television originally appeared in Look and Learn issue number 654 published on 27 July 1974. On September 1st, 1939, the day that Hitler marched into Poland, BBC Television came to an end for the duration of the Second World War, and did not start again until June, 1946. The day after the service was resumed BBC cameras televised the Victory Parade in London. During the war years, great technical strides had been made, not only in America, where the television service had continued, but also in Britain. Here many scientists and electronics engineers had been secretly developing and operating radar, which worked on the same principle as television. In the First World War, radio advanced because of the necessity for instant communications between field commanders, and huge amounts of money were spent which would have been unthinkable in peacetime. Again, in the 1939-1945 war, radar became a number one priority. Many people believe that without the use of the “magic eye” during the Battle of Britain, Britain would have undoubtedly lost the war. So, although the BBC Television Service was shut down for seven years, it did in fact emerge from the war stronger in technical resources. There was a vast number of skilled electronics engineers available from the armed services, and this, together with the “know-how” that the United States had acquired in running their television service, gave the BBC an encouraging start. 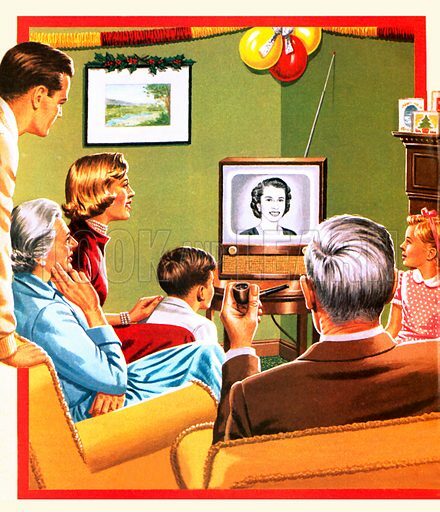 Immediately after the war, there was very little indication that within ten years there would be more people in Britain watching television than listening to the radio. Even in 1948 there were only 50,000 receivers, but the BBC were planning to extend the service to the rest of Britain, and a combined radio and television licence cost only £2. When did Look and Learn first appear? This edited article about Look and Learn originally appeared in Look and Learn issue number 964 published on 30 August 1980. Interesting articles, well-drawn pictures . . . subjects varied and exciting . . . incidents in history, how things work, life in other countries, great artists, inventors, politicians . . . all these and many more were the ingredients that went into Look And Learn in its very first issue, and are still with it today. 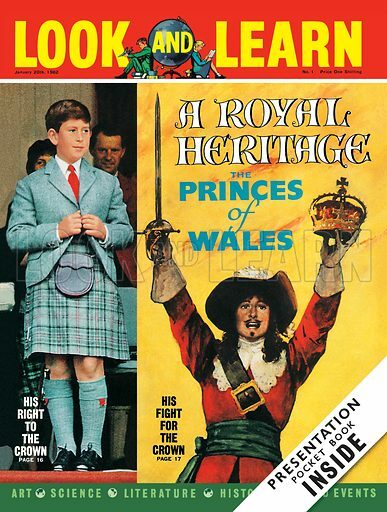 Look And Learn was launched in January, 1962, and was greeted by youngsters, parents and teachers alike as an excellent magazine. The circulation in those days was over half a million copies every week. Among the features which appear regularly in the paper one of the most popular is The Trigan Empire which first appeared in Ranger magazine. This edited article about the Aberfan disaster originally appeared in Look and Learn issue number 961 published on 9 August 1980. On Friday, 21st October, 1966, the children in the South Wales village of Aberfan had trooped to school in happy mood. At midday the school was to break up for the half-term holiday. The bell rang for lessons to begin, and children began crowding into their classrooms, where the teachers were waiting to call the register. Suddenly, while some of the children still lingered in the playground, a deep rumbling sound was heard from somewhere behind the school buildings. Moments later, hideous tragedy struck . . . Dominating Aberfan was a lofty spoil-tip, or slag-heap; one of those ugly man-made hills that scar many an industrial landscape. This tip had been formed of the accumulated waste from the neighbouring Merthyr Dale coal-mine. Anxiety had been previously expressed about a possible threat to the village from the Aberfan tip, though the Coal Board experts do not seem to have appreciated the danger; but on the morning of the 21st the Merthyr Dale management received a report that there had been some movement in the tip during the night, possibly as a result of recent heavy rain. They decided to send a maintenance man to inspect. It was as he stood on the summit of the tip that he suddenly heard a noise like thunder, and, to his horror, saw a huge mass of soil, stones and mud begin to slide down towards the village. The school stood right in its path. Neither teachers nor pupils had any time to get out of the buildings before the 40-metre-high avalanche fell on them. Walls were crushed and furniture smashed. Many were killed instantly, others trapped in the wreckage or engulfed in a deluge of mud. Not only those inside the school fell victims. Even some of the children in the playground were caught by the rolling mass before they could run clear; while, at a nearby farm, a woman and her three grandchildren were later found dead. The alarm quickly spread, and soon the villagers were desperately working to rescue the trapped and injured. Mothers waded through the clinging mud in a frantic search for their children. Rescue services joined in the action, and the search for victims went on. After darkness fell, the quest continued by the glare of floodlights. When at last the heart-breaking task was done, Aberfan mourned the death of nearly 150 members of the little community. The dreadful experience of that day taught the members of the coal-mining industry a bitter lesson; and today the formation of colliery tips is more carefully controlled, with special attention to drainage. Where Pantglas School once stood, there is now a memorial garden, lovingly tended in rememberance of the 116 Aberfan children who died.